Call it Prosthetic Flipper, but the truly inspiring Dolphin Tale is perfect family entertainment (although why it needs to be in 3D is a mystery). Based on a true story this engaging, if predictable, yarn is a boy and his dog story, here subbing the canine out for a dolphin who has severely damaged his tail in a crab tap. The answer? Technology and love, natch. Sincere and beautifully produced on the actual Florida locations of the real event, this is a wonderful movie for kids or big, wet softie. Box office in the not-so-family friendly month of September should swim along okay once word spreads about this valiant true life tale of a tail. 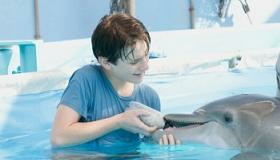 The film's soul is the mutually dependent relationship between a troubled boy named Sawyer Nelson (Nathan Gamble) and the injured dolphin he names Winter. At the Clearwater Marine Hospital, the nearly tail-less aquatic mammal in in the dedicated hands of the too-good-to-be-true Marine Biologist Dr. Clay Haskett (Harry Connick Jr.), plus energetic help from his daughter Hazel (Corey Zuelsdorff). Still, the prognosis is iffy. But when Sawyer starts ditching school for dolphin physical rehab, a new beginning for boy and beast is forged. His mother (Ashley Judd) wanting to be on board, but those pesky school officials keep insisting that grades—not good dolphin deeds—are what count in life. The story gets added gravitas with the presence of Morgan Freeman as a legendary prosthetics doctor enlisted to concoct a device that could substitute for Winter's tail. Adding dramatic tension and suspense, the hospital faces sudden closure and the whole project is thrown into turmoil. Dolphin Tale is merely treading water in the PG-friendly world of kid cinema, but knowing that the real life dolphin is still alive and flipping adds depth to the tale. Sure, the story of a boy in need and the non-human BFF who gives him hope is older than Lassie, but it's a classic trope for a reason: it works. The human actors aren't asked to stretch their talents by any means, but they all do well in bringing the story to life. You like these people and you like these actors and you like what they're trying to accomplish. Still, the real star is Winter and the remarkable footage we bear witness to of a dolphin adapting to an unnatural device like her survival depends on it—which, in truth, it does.